I’ve uncovered some issues with CR_Documentor where the context menu doesn’t appear when you upgrade your DXCore to version 3.0.5. I will do my best to resolve this issue and any other known defects in the next release, which, I assure you, is forthcoming… just sort of slowly. But it’s coming! I’ve posted the list of known issues on the CR_Documentor page for now. I bought a new laptop and I want to sync my iPod from the laptop now, not from the desktop in the other room. Unfortunately, moving your iTunes library around is kind of difficult. You can copy the library file (.itl file) over and fire up iTunes on the new computer, but it’s still going to look in the old location for the files and it’s not going to find them. Install iTunes on the new laptop. Start iTunes so the initial iTunes library files are created and I can get past the setup bits. Copy the iTunes library files (both the .itl and .xml) over the top of the new ones on the new laptop. Plug the old external drive into the laptop. Make sure the drive letter on the new laptop is the same as it was on the old computer. In my case, this is the “F:” drive. Open iTunes on the new laptop and verify all the songs are found. Update the new iTunes settings - change the location of the iTunes library folder to the place you want the music files to be, tell iTunes to automatically manage your collection, and tell it to copy any new files into your iTunes library folder. In the new installation of iTunes, select Advanced -> Consolidate Library. This will copy the music from the old location to the new location and update the database with the appropriate new locations. The only downside to this is that if you have a large collection (as I do), it’s not a very fast process and it takes up a lot of disk space - you’ll end up with two copies of your music collection. That said, once the consolidation is complete, you can delete the old copy of the collection and free up your disk space. I really wish the iTunes COM SDK allowed me to just change the file location. It’d have been so much easier just to script the move. Friday night, the 21st, Jenn and I ventured into town for a wonderful live performance of Jesus Christ Superstar. It’s possibly my favorite Andrew Lloyd Webber musical (more because I’ve listened to it since I was very, very small so there’s a lot of sentimental attachment than anything else) and this was my third time seeing it. It was Jenn’s first time not only seeing it, but hearing it, so there was a small amount of confusion at first, especially since they ran out of programs as we were walking in so she didn’t have a cast or set list. I tried to explain who was singing and such, but it took until the second half when we were able to find a program that she started getting into it. It was a really good show to catch. Ted Neeley, who was Jesus in the motion picture version, played Jesus here, too. Amazing range on that guy, and I’m really glad we were able to make it because this is apparently his national farewell tour in the role. Corey Glover, lead singer of Living Colour, played Judas and also did a fantastic job. The only real complaint I could issue had nothing to do with the show - it was my seats. When I bought them, the seating chart looked like I had some really great seats four rows from the front. When I got there, it turns out that the seating chart was broken up such that I didn’t see the entire front half of the auditorium sitting in front of me. I wasn’t four rows back, I was 30 rows back. Oh, and I got to sit next to a guy who decided it was his day to go on a smoking and drinking binge, so not ony did he stink to high heaven, but I had to repeatedly remind him not to sing along. Other than that, it was a great show and I’m glad we made it. I couldn’t think of a better way to start the holiday season than a great show with some somewhat relevant subject matter. Good times. 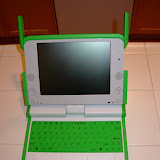 Yesterday I received my XO laptop from the One Laptop Per Child “Get One, Give One” program. I got some pictures of the laptop being unboxed and booted up for the first time so you can check those out if you’re interested. It doesn’t ship with much in the way of instructions - it relies on you either connecting to their web site to get started or “exploring” the interface to see what things do. That actually brought me to my first problem - connecting to the Internet. The way the networking on the thing works, you visit a “neighborhood” page that displays a graphical representation of the wireless access points available to you as well as mesh networks and other XOs that you can connect to. That was my first stumbling block: It only displays wireless access points that broadcast their SSID (mine didn’t). It runs a flavor of Linux, so I suppose if you’re a Linux person you could do some manual configuration and get it to connect that way. I’m a Windows person, and while I have run Linux before, I’m not really that knowledgeable about it, so the best I could do was try their manual wireless network association steps to see if that worked. It did… for as long as I was in that terminal session. But as soon as I rebooted, the connection was lost and I was back to square one. So, rather than fight that beast, I just turned SSID broadcast on. Hey, that wasn’t really stopping the malicious folks out there anyway. It won’t connect to WPA networks (yet), which isn’t a problem for me since I’m still in the stone age using WEP. After some trouble getting the security on it set up, I finally got connected. Honestly, I don’t know how kids are supposed to do this, but maybe they assume that school wireless access points are just open without any security or something. Maybe that’s how it really is. The only other real problem I had with it was that the initial setup (when you first boot up) asks you your name and what colors you want your little computer icon to be. (Your icon represents you on the network.) Once you’ve set them, though… there’s no control panel applet or anything to change them with. It took me a while, but I found that they have a command-line interface to change these things called “sugar-control-panel.” Got my stuff all customized up and now I’m set. The interface is primarily graphically-driven. There’s very little text, which is good for its purpose (kids, developing countries, etc. ), but not so accessible until you’ve really explored the thing and learned what it all means and does. Applications are referred to as “activities” and it ships with several pre-installed ones including a web browser, an RSS reader, a paint program, and a Python programming environment. There’s no email program, but there is a Gmail activity currently under development (right now it just launches the browser). All in all, I think it’s a pretty great tool. If they’d had this in school instead of ye olde Apple IIe, I’d maybe have learned something more than the BASIC code that runs the cannons and castles game. On the other hand, I’ve found already that I’ve interfaced a lot with a Bash prompt (the “terminal” activity) already and, without any instruction, I’m not sure how kids are going to know what to do with some of the stuff. From “I’ve never seen a computer” to “I’m programming in Python” is a pretty steep learning curve. I think the real good stuff will be from the additional activities you can download as well as coupling this with a teacher’s curriculum. If you’re interested in learning more about the One Laptop Per Child charity, how to give, or how to use the XO laptop, check out www.laptop.org.